See the carboncopies website for a background. All talks and discussions were recorded on video and may be available upon qualified request (see the contact info on the carboncopies website). The short video summary below is public. ASIM2010-1 First Online Workshop on Advancing Substrate Independent Minds from teleXLR8 on Vimeo. 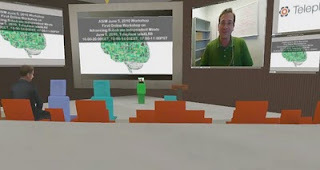 A brief summary of excerpts from the June 5, 2010 online workshop “Advancing Substrate Independent Minds (ASIM-2010-1)”. ASIM is driven by a community with an objective-oriented and action-oriented approach that is aimed at the development of technological means by which to achieve the transfer of cognitive processes from a human brain to an artificial substrate. A convergence of nanotechnology, biotechnology, brain imaging, etc. promises to accelerate cutting edge developments towards processes such as whole brain emulation, mind transfer, digital personalities, gradual neuroprosthetic replacement and brain preservation. The first public ASIM workshop will be held on August 16-17, 2010, as a satellite meeting to the Singularity Summit 2010 in San Francisco. For more information, please visit http://www.carboncopies.org/upcoming-workshops. Mind Uploading is feasible in principle. This is the only position compatible with materialism, the scientific method, and current scientific knowledge. Achieving MU may take longer than we wish and require reformulations of current notions of self. Having worked so many years in research and engineering management I know only too well that achieving an ambitious objective very often takes more time than expected, often takes much more time than expected, and always takes more money than expected. So despite many very promising ongoing advances I remain very skeptic on the timeline. I don’t think even the first MU research demonstrators will be achieved by 2050 (I am happy to see that others are more optimist, and I will be VERY happy to be proven wrong). But, as I said, Mind Uploading is feasible in principle and it will be achieved someday. Achieving MU will probably require a combination of all methods proposed so far, and then some. may be available to those of my generation. Though our natural remaining lifespan is not likely to be long enough for us to benefit of uploading technology, a combination of these methods may transport (a sufficiently detailed instance of) us to a future where Mind Uploading is an operational reality. Giulio Prisco is a writer, technology expert, futurist and transhumanist. A former manager in European science and technology centers, he writes and speaks on a wide range of topics, including science, information technology, emerging technologies, virtual worlds, space exploration and future studies. He serves as President of the Italian Transhumanist Association.